All packed up an ready to go! Everything is loaded in my backpack. The supply boxes are packed and labeled for each section of the trail they are headed for. The piles are gone! My Virgo friends and family (especially my husband) are glad the piles are gone. I’m also glad the piles of gear are gone and packed where they belong. It means it’s getting closer to the time to leave for the trail. There’s just one more thing I had to take care of for this hike before I left. I had to set up a blog site. I wanted to blog along the way to tell the story of my hike to friends and family. I chose the Trek site. I love the Trek. I love reading the posts on the Trek. That is why I choose it for my blog. The only problem was I had never blogged before. I’ve never set up a blog site. The Trek has a blogger manual that has everything in it you need to know to set up your blog. The problem was it all sounded like Greek to me. I couldn’t figure it out. Remember, I’m an elder. Enough said. Luckily, I knew someone who blogged on the Trek. So, I called my “new best friend” Carla to help me. She walked me through the ‘ how to’s’ to get my site up and running. “You know what you’re doing”, she would say, the whole time I’m muddling through trying to post and download or upload pictures from phone to computer and phone to site. Thanks, Carla for the encouragement. I’m getting better with each word I type and each picture I download or upload; which ever way they’re going. Carla Robertson is a blogger on the Trek who has already thru hiked the AT. She has written many helpful blogs for backpackers, especially women. You can find her blogs on the Trek by typing her name in the search box on the site (I think). Don’t quote me on that. I’m still learning. Hi, I'm Waterfall, a retired elementary school teacher. I've been section hiking the AT for seventeen years and have finished one fourth of it in all that time. I know, I hear all of the thru hikers out there saying, "What?!". This year is the first time I'm going to be on the trail for two months straight, hoping to do another fourth of the trail. Next year I'll do the other half. 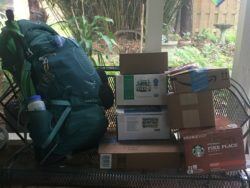 I needed a blog space and The Trek was gracious enough to allow me to share space on their site with the Bloggers of 2017 thru hikers. Trust me, I'm honored. I'm not doing the AT hike your way, thru hikers, I'm doing it my way, a little at a time. But, I have the same thoughts in my mind as all of you, that I will get it done. I'm excited, nervous, and anxious and can't wait to get out there, again. Aww, Waterfall, it was a pleasure to help you! I loved getting to meet you in person and having the chance to sit outside on the deck and figure it all out together. And you really do know what you’re doing! Keep rolling and we can’t wait to follow your journey! Hugs!